BRC: Hi Luciano, hi Rana! It's great to have you here. Luciano: Hi Katya and Bioware Russian Community! Rana: Hi! Thanks for having me! BRC: The most burning question is, of course, how does Bioware pick face models for their games? How did you become the face models for Kaiden, Samara and Morinth? Why do you think they chose you? 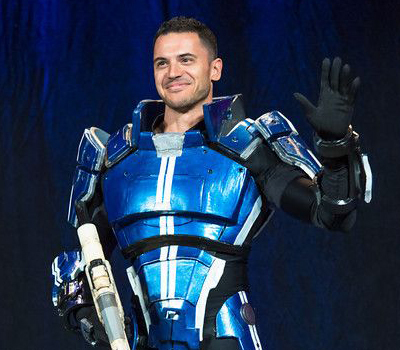 Luciano: As most video games probably do, Bioware utilized a talent agency to scout for actors and models. I assume they selected me because I looked most like the character drawing the envisioned. Rana: I don't know how they pick their models, I'm guessing it's just based on the director's vision of what they want the character to look like! I was picked through a website called "Model Mayhem." BioWare put up a casting notice that I submitted to. They told me they were having a hard time finding the right model for Samara. They wanted someone with strong features. I think they chose me because Samara is a very strong, commanding presence, and my features portrayed that. BRC: Can you describe the technical side of the job? Do they photograph you in different angles? Do you need to "play" all the emotions your character will be feeling? Or maybe they just place markers on your face and do the whole motion capture thing? Luciano: There wasn’t much to it. I sat on a special chair rigged with lights and cameras. The producer than would explain a scene and I would react to what was happening. A motion capture camera would then swing around and record my facial expressions. Rana: It was only a 3D scan, so for the first part of the process I just wore a wig cap and sat in a chair that rotated 360º while the machine scanned my face. Casey Hudson was there and asked me to keep a "stern/strong" look on my face. He said typically they want a blank, expressionless face, but with Samara they wanted something different. Then they took me in another room to take pictures of the range of motion in my face. So they had me do things like smile, and raise one eyebrow. The whole thing took a total of a half hour! BRC: Have they told you anything about your character before you signed the contract? You must've been curious who would be "wearing" your face? Luciano: No. I had no idea who or what the project was. I only knew it was going to be for a video game. It was very classified. I had forgotten about it until a few years later when a friend showed me a picture of Kaidan because he thought it looked like me. Rana: The only thing I knew was a short description of the character. I only remember it said "high-priestess." I was very curious! But they were very secretive! They didn't even tell me I was going to be two characters or a blue alien! BRC: Would you agree to play a villain or a traitor? You know, some actors complain how the dislike for the characters can carry over to the actors who played them. Luciano: I wouldn’t care either way. I think playing a villain may actually be more fun. Rana: I think I'd be ok with it because it's just a portrayal, not actually me, that's what acting is! BRC: We are all curious what do you both think about your characters. Rana, do you consider Morinth a villain? BRC: And what do you personally think of Samara? Would you want to be friends with her? Rana: I think Samara is an amazing, strong and sad character. Her dedication to the code is so strong, so much discipline. I think I could be friends with her, might be hard to have a girls night with her though! BRC: Samara has a very strict Code that governs all her actions. That must be hard, but on the other hand every person has a set of moral values. What is your code in life? Do you have principles that you will never cross under any circumstances? Rana: I wouldn't say I have a strict code. I do my best to treat others, and myself with kindness and respect. I try to be empathetic in tough situations. Other than the obvious "be a good human" principles, I can't think of any others right now. BRC: Luciano, and what do you personally think of Kaiden? You know, in ME3 they made Kaiden a romance option for Mshep as well as FemShep. Some fans went along with it, some got angry about the sudden personality shift. What's your take on this matter? Luciano: I think it’s great and it’s a positive shift in game culture. People that have a problem with that, have their own issues they need to overcome. BRC: A question we have to ask: have you played Mass Effect? Luciano: *shrugs* I’m sorry to say I’m not a gamer. Rana: I have only played the 2nd one (and Andromeda multi-player once). BRC: Who did you choose in Samara’s loyalty mission – her or Morinth? And what was your Shepard like in general? Rana: I chose Samara, but still need to do a play through where I choose Morinth (to get the full experience). I went with the default Fem-Shep, and played Paragade, I couldn't help but punch a few people! BRC: Yeah, I know the feeling. But back to Mass Effect work – has it changed anything for you? You often go to conventions and meet with Mass Effect fans. And, of course, everyone knows who Kaidan or Samara is. But do people recognize you in the streets? Were there any fun stories you can tell us? Rana: I've only been recognized a couple of times here in Los Angeles. One was a little embarrassing. I was at a grocery store buying ahem.. "lady products" and when I got home a fan messaged me and asked if that was me in line in front of him! He didn't mention anything about what I was buying though! BRC: Those are good ones! Bet that was hilarious. But in general.. Did you enjoy face modeling and would you like to do again? Rana: I really loved it! Hope I can do it again for sure! Luciano: Sure, it was a fun job. I would definitely do it again if offered another role. BRC: Luciano, we know that besides working a lot as a model, you also acted in reality shows and movies. Do you want to be a professional actor? If so, what role would you play? They say that you can shoot a bow and ride horses. So a fantasy movie, perhaps? Luciano: I’ve done a few reality shows but no movies. I wouldn’t consider reality shows acting and no, I don’t have any interest in being an actor. I’m an entrepreneur and my goal is to open a craft beer bar. I’m not sure where you got that information about the bow and horses. LOL Sure, I know how to shoot a bow and arrow and I’ve ridden horses a couple of times, but I’m not an expert in either. BRC: And what about you, Rana? Rana: I would love to have a great comedic role, something like an "I love Lucy" type character. I really love making people laugh! BRC: Thanks for your time, Rana and Luciano! It's been a pleasure talking to you. Do you plan to visit Russia sometime? We would love to chat with you again! And Rana, you know we have a city called Samara here! 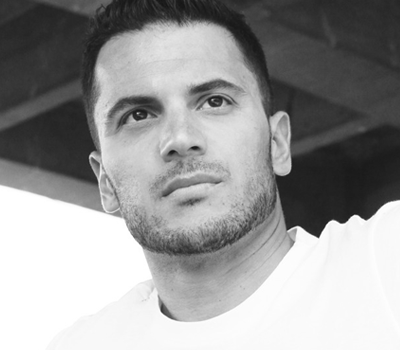 Luciano: I love to travel and visit different cultures but unfortunately my schedule doesn’t it allow it at the moment. Plus, I don’t think I would be comfortable visiting Russia until they change their laws and stop the persecution of the LGBTQ community. Rana: My pleasure! I would love to visit Russia! If there are any conventions out there you'd like to have me at, ask them if they'll invite me as a guest! I've seen that city of Samara! That would be cool to visit!